Did I just say "Chocolate Giveway"? Hurray! 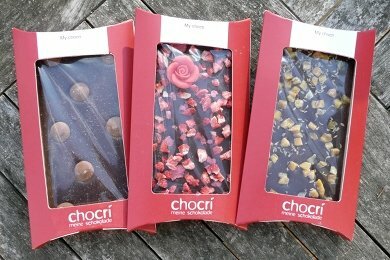 Chocri is the chocolate company that allows you to create personalized chocolate bars by adding your own toppings. I reviewed Chocri bars last year (see: Customize Your Healthy Chocolate Treat) and I loved them. Why is Snack Girl featuring chocolate? Well, high quality Dark Chocolate is good for you! The problem is portion control. And, as well all know, chocolate consumption can get out of hand. This chocolate bar doesn't come cheap. It starts at about $9 and then you start adding the toppings. The good news is that can be 6 servings - and because it is more expensive (and more tasty) than your average chocolate bar, you will be able to stop yourself from eating the whole thing in one sitting. Savoring expensive chocolate is a great way to give yourself a treat. Go on over to Chocri and start creating your chocolate bar. To enter the giveaway: comment below about the toppings you would use to make your chocolate bar. Comment below on your favorite toppings from Chocri. The two winners will be announced on December 28th, 2010. You will have 2 weeks to e-mail us back with your home address so we can mail the prize. After playing with their engine, it's dark chocolate with fleur de sel, pecans, toffee bits, silver, and cocoa nibs. A $14 chocolate bar. wuf. The White Christmas bar looks delicious:) Gingerbread spice and mini snowflakes...awesome! I would get the milk chocolate bar with lime chocolate drops, or the dark chocolate bar with gummy bears. The decorations are pretty too, particularly the marzipan rose. I love this site but can never get myself to send the money on it. I would do dark chocolate with sour cherries, candy cane, and pretzels pieces! Yum-o! Dark Chocolate with Bourbon Vanilla, Cinnamon, and Pecans. I'm a sucker for pecans. Would love to try the milk chocolate & white bar with fruit toppings of dates, figs, strawberries, & blueberries! Yum! Milk chocolate with berries -- strawberries, raspberries, blueberries! I would do milk chocolate with strawberries and bourbon vanilla! Toffee, Cranberries, and Raspberries for me! NO doubt toffee and gummy bears!YEAH!! How about something crazy like roasted pistachios and red pepper flakes? i like things that bite back so i'd probably play with ginger, orange pepper, ground chili. i like fruit too though... maybe sour cherries & blueberries... so many choices. Wow! Definitely toffee and caramel! Then I'd also want a fruity white chocolate bar with strawberries! OOOOOHHHHHHH I'm a chocolate addict!! I love dark chocolate, and my fav toppings on chocri are the blueberries, caramel chocolates, pretzels, and the snowflake toppers they have for winter!!! Oh gosh--so many great choices. I think I'll get creative and try banana chips and sea salt in dark chocolate! Should I add toffee bits? Yes!!!!! wow, this is so tempting! I wanted so many things, but I'd have to go with ground coffee beans, coconut shavings, pecans, pretzels, and blueberries. YUM! What a wonderful Christmas treat that would be! I'd pick: Dark chocolate with apricots, walnuts and muscili and cinnamon! Yum! Oh, and caramel too! I am posting on FB because I don't tweet! Hope I'm still elligible! HOLY COW. How does one pick?! I want to make about a billion of these!!! I guess the first one I'd make would have: orange, bourbon vanilla, coriander, and cinnamon cornflakes. Toffee!! and bourbon vanilla. YUM! I wanted to pick all the toppings! But if I couldn't do that it would be dark chocolate, raspberries, sour cherries and roasted almonds. YUM! I'd definitely do Dark chocolate, probably with sunflower seeds and cranberries. or maybe mango! Treasure Chest - chocolate, carmel, toffee = YUMMY!!! Date bits and cashews! Yummy! Pecans, toffee and fleur de sel! OOOh!!! Dark chocolate with sour cherries, appricots and raisins! Yummy!!! Dark chocolate with raspberries and hazelnut brittle! Yum! Dark chocolate with sea salt, ground chili, and orange pepper. Dark Chocolate and toffee bits! Sounds mouth watering delicious! Wow. Definitely dark chocolate w/bourbon vanilla. Then comes the hard part: sour cherries, pecans & salted pretzels...toffee bits, bluberries and seas salt...apricots, roasted almonds and ??? Chocolate is my number one weekness. As much as I would love to win this certificate I wouldn't be able to use it for myself. I've made a promise to myself to get down to my goal weight so I would make the certificate a gift to someone who can't afford such a delightful taste as this. But my favorite topping would have been peanut butter cup chips. Smooth and curiously enigmatic. how much is shipping btw? (To the tune, All I want for Christmas) All I want for Christmas is a Chocri Chocolate Bar, a Chocri Chocolate Bar yes a Chocri Chocolate Bar. Gee if I could only have a Chocri Chocolate Bar, then I would be a grateful chocoholic! If I could choose, my favorite toppings, PB Drops, Nougat Pieces and Cocoa Nibs sound delicious. But gosh ol gee how happy I'd be, with any of the other additions! All I want for Christmas is a Chocri Chocolate Bar, a Chocri Chocolate Bar yes a Chocri Chocolate Bar. Gee if I could only have a Chocri Chocolate Bar, then I would gladly share a piece with Snack Girl!! Thank you! I would start with dark chocolate and then add one or more of banana chips, mango cubes, pineapple or orange. Or I would do dark chocolate and crushed candy canes (the peppermint bark you see in the stores around the holidays would be great if it didn't have white chocolate - yuck!). YUM! Dark Chocolate, raspberry, flower mix & pretzel! I just managed to create an $11 bar of chocolate for myself. In the end, maybe less is more, but I love the idea of the organic pretzels, vanilla bourbon, and cranberries. Yum! My chocolate bar would begin with a dark chocolate bar, topped with bourbon vanilla, ginger and pistachios. Yum! -raspberries and organic mint leaves!! I think walnuts, coconut & blueberries would be awesome! definitely the cool ones like basil or jalapeños. My combo would be strawberry,pine nuts,mac*adamia,sprinkled with real gold and silver. Completely yummy and B U T FUL!!! Tis the season for gingerbread spice, bourbon vanilla and snowflakes on my dark chocolate bar. Merry Christmas to all!!! I love the idea of dark chocolate with dark chocolate chips and coconut! Milk choc and i would have to go with the crushed candy cane for the Holidays!!! O.M.G. What a brilliant idea! I love the sea salt, pretzels, mango and...wow - it's really difficult to decide. I hope I win!! I have never heard of this, but would love to try it! I'm thinking the "Love Potion" bar sounds great, but I might like to add strawberries into the mix! This would be a great "re-gift" to my dad, who L-O-V-E-S dark chocolate! All this chocolate love and it gets to benefit children in Africa, too! Sign me up! I haven't heard of this chocolate either - it looks So yummy! I would choose gummy bears, caramel chocolate drops, gingerbread spice, Hazelnut Brittle, Mini Christmas Cookies, Bourbon Vanilla.. mmm ! 72% dark chocolate, blueberries, fleur de sel and volcano cashews! I settled on two flavor combos, both made with the dark chocolate option, of course:) for an elegant treat, bourbon vanilla and marzipan roses. For a down-home candybar-esque nibble, peanut butter drops and salted pretzels. Yum! dark chocolate with toffee and fleur de sel. yum. OMG!! Definately the dark chocolate with coconut shavings, cahews, toffee and the caramel chocolate drops. I think I have to ask Santa for one!! Must have the dark chocolate...then add fleur de sel, raspberries, caramel drops. Mmmmm, definitely the dark chocolate, with Fleur de Sel, Bourbon Vanilla, and toasted hazlenuts. Sounds heavenly. I would add pistachio nuts, almonds, and dried cherries. Yummy! I think cashews and toffee would be a good combination. This website is one of the most exciting websites I have been to in a while! I would have to put craberries and hazlenut brittle along with mini marshmellow bits! Gummy bears would be adorable! I'd play with some dried fruits too, possibly blueberries and strawberries. The holiday decor is TOO CUTE! I love the little bear! If it was for Valentines day, I'd decorate it with some confection hearts and sprinkles as well! So fun! A better question would be what wouldn't I put in it? haha (: dark chocolate + cayenne pepper + sea salt + peanut butter drops + organic pretzels + real golden flakes + a cute little heart decoration. wooooh my mouth is watering already! Oh yum! I think the Candied Rose Petals would be really different and I love Gingerbread Spices. goji berries, blueberries, and almonds = yum! My chocri would be topped with pomegranite seeds. I would have Dark Chocolate with Blueberries, Caramel Chocolate Drops and Fleur de Sel. I'm going with dark chocolate: sour cherries, dates and walnuts. Oh my goodness!! This seems so yummy and such a treat! i would pick dark chocolate with dots of white chocolate and roasted pistachio nuts and preztels.i'm big on sweet and salty stuff lol. Oh goodness - I could stay on that website all day! How fun! My favorite combo so far is dark chocolate with almonds, hazelnut brittle, salted pretzels and Bourbon vanilla. Happy Holidays!! I would love Fleur de sel, caramel, cinnamon, cranberries, walnuts, almonds, anything, really! Oh, my stars. There are so many worthy entrants. The topping I'd pick would be raspberries and fleur de sel. Oh my, these look amazing! I am definitely a toffee girl. Keeping my fingers crossed to get a chance to try this out! Well..as I started to peruse the Chocri site I thought Dark Chocolate with strawberries and basil would be my choice but then I saw the Bourbon vanilla and Lord knows I love me some Bourbon! But then I thought Caramel & rosemary could be awesome with some white chocolate..or mint and lime like a Mojito! (I dont have a drinking problem..lol) but then I was sad there wasn't a bacon option or better yet a maple bacon option.i can't decide!! It all look so good! I'd use a milk and white chocolate base with raisins, strawberries, pineapple, and peanut butter drops. I'd choose a dark chocolate bar with pear, ginger, and pistachios. Yum! My favorite is candied rose petals and rosemary on dark chocolate. I love dark chocolate with any kind of nut. I would go for fleur de sel and caramel chocolate drops in dark chocolate!! YUM!! Can't beat that salt/caramel/chocolate combo! I wouldget blueberry, pineapple and toasted coconut with almonds. Yum! THIS CONTEST IS CLOSED - DECEMBER 28TH, 2010.